Pendley Farms had another fruitful but short season in 2016! Thanks to all of our GREAT customers we harvested over 1500 lbs in 5 weeks. Due to this year's weather we had a lot of ripe blueberries all at once and then it got really hot and dry and the blueberries were over. 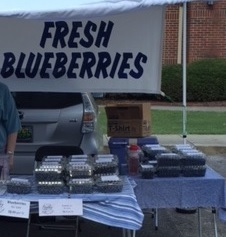 We continued being a part of the Bailey Cove Farmers Market at St. Thomas Episcopal Church in Huntsville, AL (held on Saturdays from 8 a.m. to Noon during the summer months). This year we also added the NASA Farmer's Market on Redstone Arsenal on Tuesdays from 10 a.m. to 1 p.m. Our focus is still on expanding our "Invited You Pick" however. If you know someone that would be interested in coming 'to the Farm' to pick, please have them send us their email and name at info@PendleyFarms.com and they will be notified next year when we have our 'You Picks'. "My family looks forward to coming to Pendley Farms to pick every year!" "We come to re-stock our freezer for the year and always eagerly anticipate the new Pendley Farms Blueberry Recipe." "These are the BEST, most delicious blueberries - so much taste!"